When Wagner Memorial Lutheran College moved from Rochester, New York, to Staten Island in 1918, it was a truly tiny school — just 42 students, enrolled in a high school and junior college program, with fewer than 10 professors. It used a German curriculum and prepared young men to become pastors of Lutheran congregations. But the world was changing in 1918 — and so was Wagner. 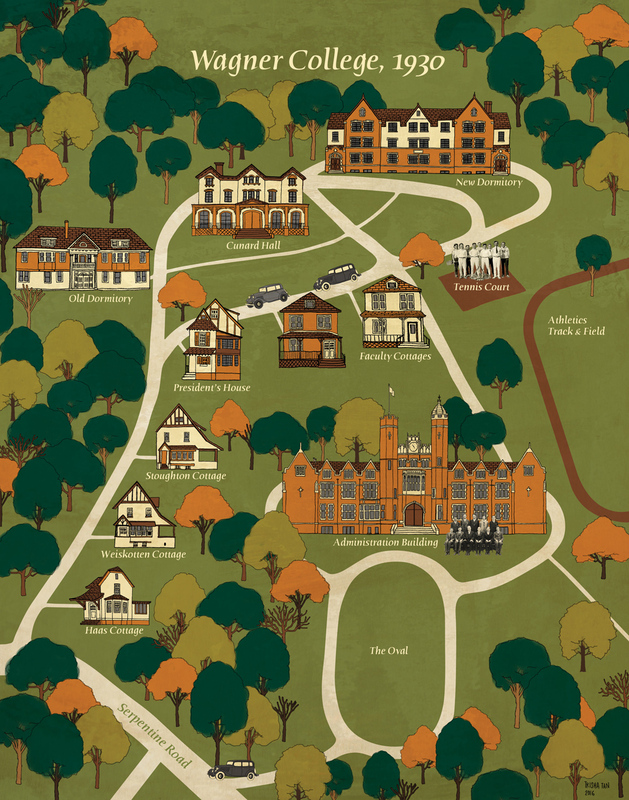 The move to Staten Island, spearheaded by local Lutheran minister and 1894 Wagner College graduate Frederic Sutter, was part of a master plan to bring Wagner College into the 20th century and transform it into a new kind of school: an American college. By the time that plan was completed, around 1935, we had 18 professors and 280 students working on their bachelor’s degrees. And all of them needed places to live, and work, and study on campus. The first few years of life on the Staten Island campus were pretty rugged, by all accounts. Living space was at a premium for students and faculty alike. Two professors, George Haas and Clarence Stoughton, lived with their wives in tiny, two-room apartments on the third floor of the old Cunard villa. A third, Herbert Weiskotten, could not join the faculty until better housing was available. And so, in 1922, work was begun on three new faculty homes, named for these three pioneering professors — Stoughton, Weiskotten, and Haas. Between 1922 and 1930, Wagner College added to its campus a dormitory, three faculty homes, and the building that has become the College’s architectural signature, Main Hall (then called the Administration Building). Only one of these buildings is no longer extant: the Weiskotten Cottage, pictured here. The Stoughton and Weiskotten homes were designed in the Craftsman style with half-timbering highlights, popular on Staten Island at that time. We have no record of the architect’s identity, but the structures bear striking similarities to houses designed by architect Henry G. Otto on nearby St. Paul’s Avenue. Otto also designed Pastor Sutter’s home in 1922. The Stoughton cottage now houses our public safety and human resources offices. Affectionately known as “Prof,” Stoughton taught English and history, and later played a major role as the College’s first lay president. The Weiskotten cottage, on the other hand, is one of the very few old buildings on campus to have been demolished; it stood on the site occupied by the Horrmann Library, built in 1960. The Haas cottage is now the home of Wagner’s Department of Lifelong Learning. (The late Chaplain Lyle Guttu lived there for nearly 30 years before that.) It replaced a decrepit gatehouse that stood on the campus property when we bought it in 1917. Wagner’s trustees had planned to move that old gatehouse about 50 feet into campus and refurbish it as a faculty residence — but the longer they looked at it, the more it became clear that it wasn’t worth renovating. The problem was they had already poured a new foundation for it at the new location. Their solution? They took the old gatehouse’s measurements and built a new cottage with the same dimensions and the same architectural lines as the old one — but with some anomalies. The original house was a simple example of shingle style architecture, so called because the roof shingles were used to cover the walls as well. But the Haas cottage was stuccoed instead, like the other homes on campus. That explains why it has the distinctive roof lines, doorways, and windows typical of a late 19th-century shingle style house — but no shingles! Professors weren’t the only members of the young Wagner community who needed places to live. With our rapidly growing enrollment — nearly doubling in the first two years — we would need more student residence space than the boys’ dormitory (later called North Hall, and now Reynolds House) allowed, and quickly. The New Dormitory, now called Parker Hall and used for faculty offices, was dedicated in 1923. The New Dormitory, as it was first called — later known as South Hall, but rechristened Parker Hall in 1961 — was finished in time for the opening of classes in September 1923. It was the first of two new campus buildings designed in the collegiate Gothic style by architect George Conable, who had also designed Trinity Lutheran Church, home of Pastor Sutter’s congregation. It was meant to house up to 70 students, but since fewer beds were initially required, much of its first floor was used as library, classroom, and office space. In 1925, College leaders announced the next major step in the creation of a modern Wagner College: a $500,000 endowment campaign. New York state law required a half-million-dollar endowment for any institution granting bachelor’s degrees — and Wagner had to be able to grant degrees in order to survive. By the time the February 1926 college newsletter was printed, the campaign was declared a success. Although it took another two years for Wagner to jump through the additional bureaucratic hoops necessary to grant baccalaureate degrees, the stage was set for growth. The college program doubled in size between 1925 and 1926, since those enrolling in 1926 could be fairly sure that they would earn a bachelor’s degree by the end of their Wagner career. The increasing enrollment put extra pressure on existing facilities, making one more new building essential: a “recitation and science hall,” with multiple classrooms, a combination gym and auditorium, real science labs, a full library, and offices for faculty members. Ground was broken on the new Administration Building, as it was called — we know it as Main Hall — over the summer of 1928. Architect George Conable’s new collegiate Gothic building, which became the college’s architectural signature, was finished by February 1930. The official dedication was held on the annual College Day gathering on May 30. Main Hall (formerly called the Administration Building) in 1932, when the trees surrounding the Oval were saplings. the election in May 1935 of Wagner’s first lay president, Clarence “Prof” Stoughton. Take a tour of the campus when the College first settled on Staten Island in 1918 in Wagner History Tour, Part I: The College's New Home on Grymes Hill. Finish your tour with Part III: The Boom Years, covering 1946 to 1970.